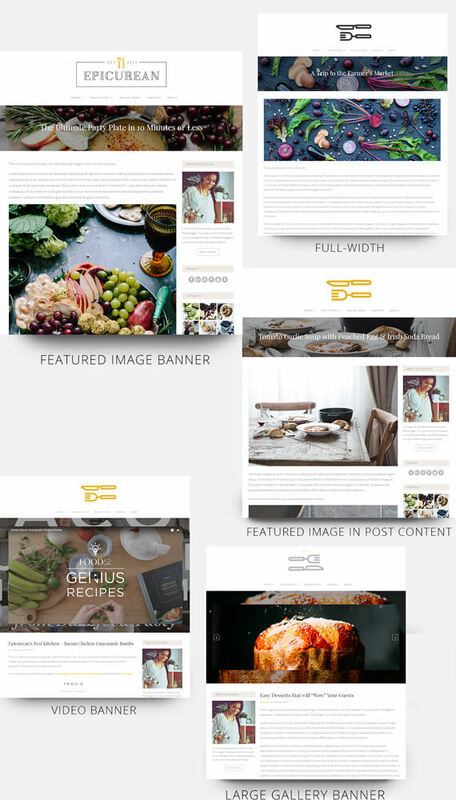 Epicurean Theme A beautiful food and recipe blog WordPress theme. 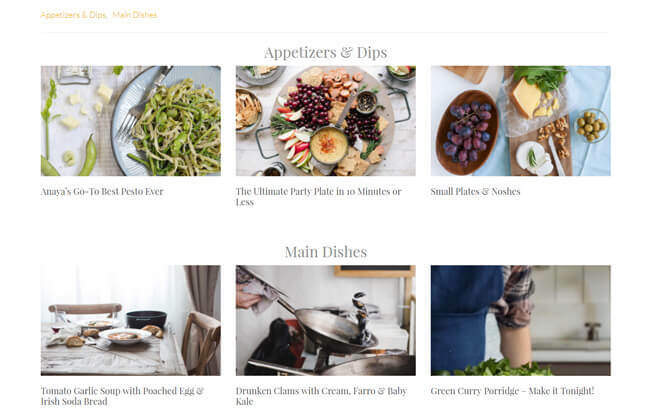 The original Food Blog theme from Nimbus has powered tens of thousand of top food blogs since its launch in 2013. Since then, the community had been asking us for another. Meet Epicurean. 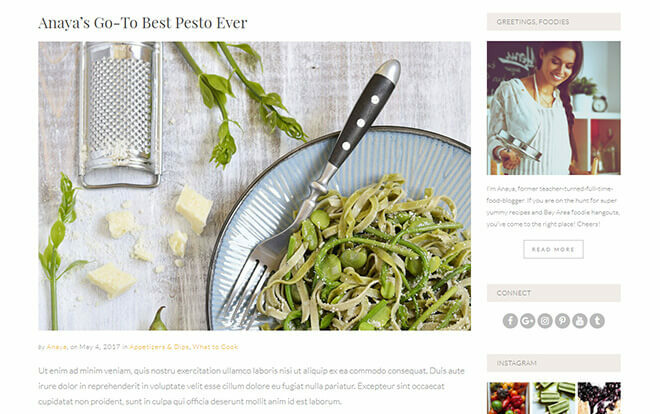 A beautiful WordPress food blog theme for discerning, creative, food bloggers. Great cooking entails a lot of trial and error before getting a recipe to taste delicious. In fact, it takes time, patience, and a lot of knowledge (or luck!) to get things just right. 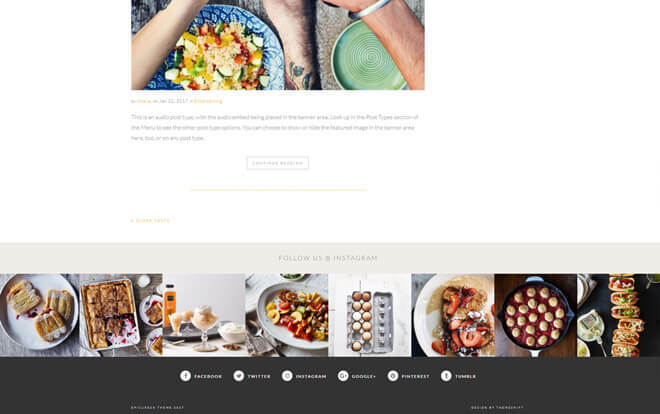 With Epicurean, you can rest assured we spent a lot of time perfecting this theme from the inside out so that it will perform flawlessly when powering your food blog. Standard layout: your classic blog layout with big images, great text-treatments, and a sidebar. 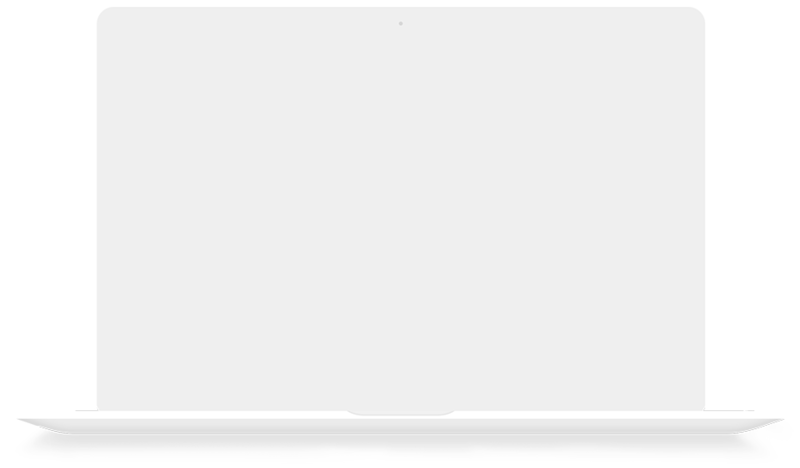 Grid layout: an easy on the eyes grid-image style format with a sidebar. Full-width grid: a wall-to-wall grid layout to make reviewing your posts easy on the eyes. 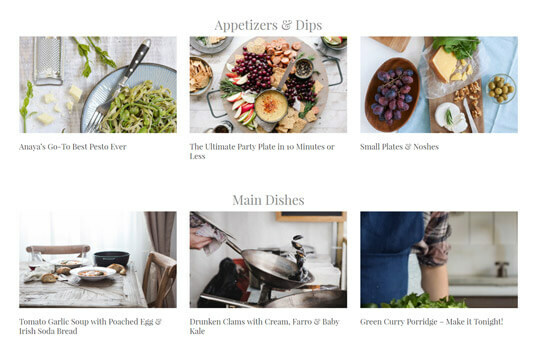 Each layout comes with a bold, full-width frontpage slideshow enabling you to place your most mouthwatering recipes front-and-center. The theme comes bundled with a full suite of custom widgets like the About Me Widget, Recent Posts, Tiled Instagram Feed, and Social Sharing Buttons. 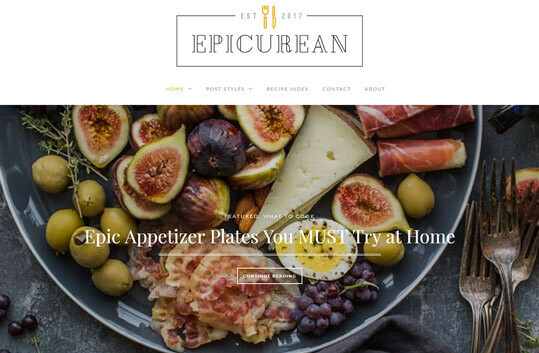 Epicurean is the right template for you if you’re looking for a beautiful food blog WordPress theme that puts your recipes front and center. It’s time to dream up a wonderful new recipe to share with the world using the Epicurean theme. Choose from one of three homepage layouts – standard, grid, and full-width grid. Each comes with a bold, full-width banner, complete with a featured post title and Read More button to get site visitors started right away. 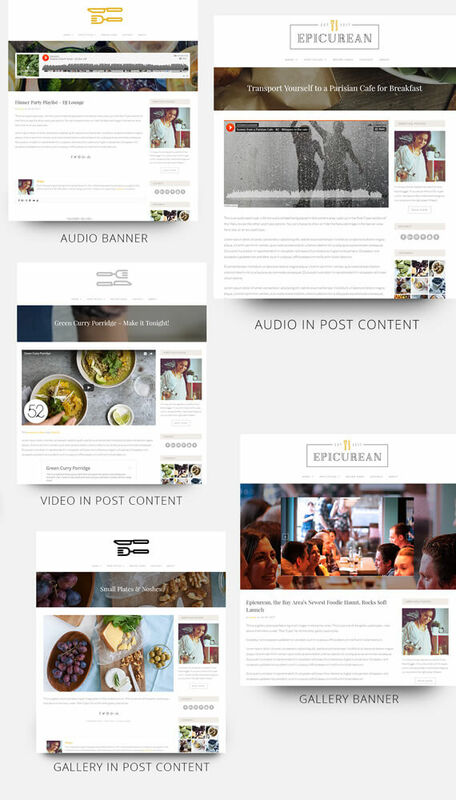 Epicurean theme supports 10 post layouts including multiple video and audio options. Running a successful food blog will typically involve posting a large volume of recipes. What tends to happen over time is that your older recipes will be pushed deep into the pagination on your blog. We solve this issue but providing a powerful custom Recipe Index page template that allows you to display all your recipes in grouping you designate using basic WordPress Categories. Great food blogs use great food images. This is just a reality of the business. And for this reason, you will spend a lot of time and effort creating the best images possible to show off your kitchen masterpieces. 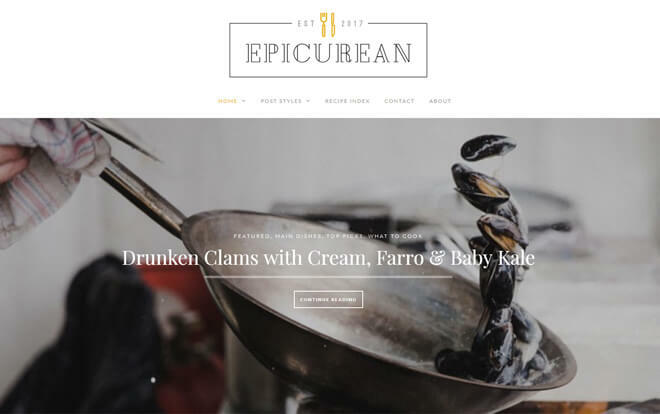 In order to best showcase your photography, the Epicurean theme offers a massive full-width hero banner and content slider. This feature means you can put your very best content in front of your visitors the minute they land you your website. WooCommece is the gold-standard across the internet when it comes to building eCommerce websites using WordPress. 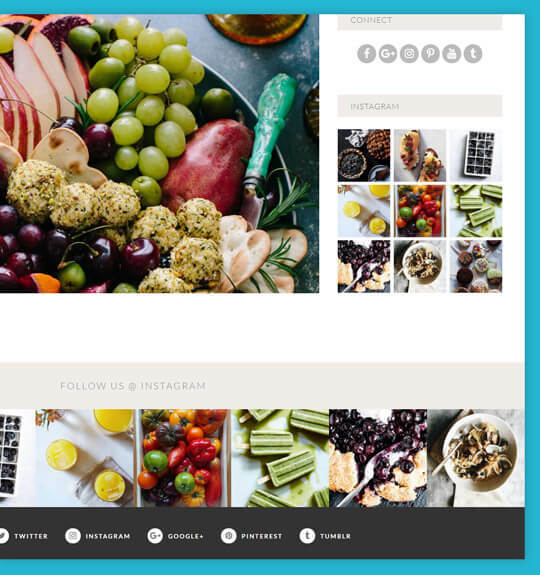 For this reason, the Epicurean theme fully supports WooCommerce with custom templating and styles to match your carefully sculpted brand identity. 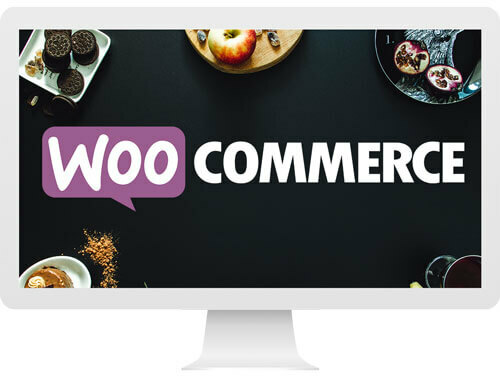 WooCommerce has been used by successful food bloggers to sell physical items like branded shirts, hats, and kitchen utensils, or digital items like ebooks, premium recipes, and photographs. It's fun to build a community of readers and watch your traffic numbers grow, but it's even more fun when you find a way to monetize your traffic and build a business out of your passion! 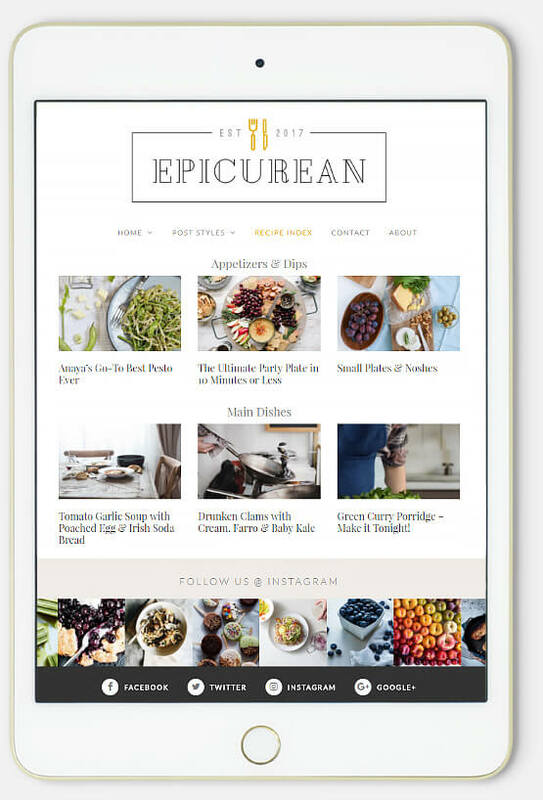 Epicurean theme supports the powerful WP Ultimate Recipe plugins which enable you to post beautiful formatted recipes directly into your blog posts. 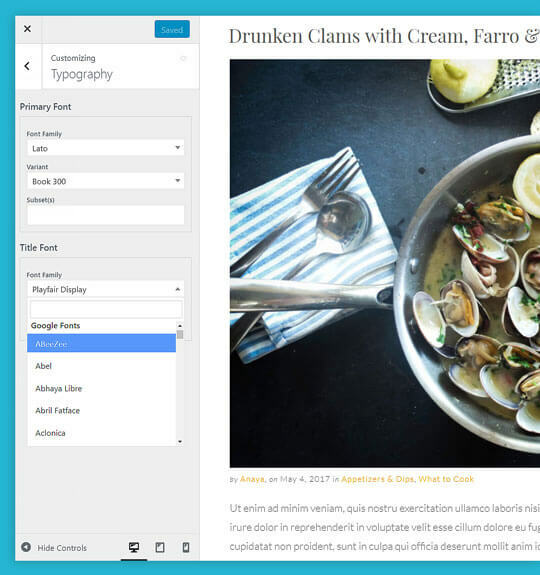 This ability makes creating complex recipes easy to document, publish, and pleasant for your reader to follow. WP Ultimate Recipe sports a fully responsive recipe card shortcode builder, embedded image support, and uses schema.org/Recipe JSON-LD metadata optimized for Google Recipe search. As the traffic numbers on your blog grow you will increasingly be contacted by potential partners in the industry and writers who would like to collaborate with you. For this reason, it's a very good idea to have a designated contact page where a simple form converts your reader's message into an email that is sent to you. 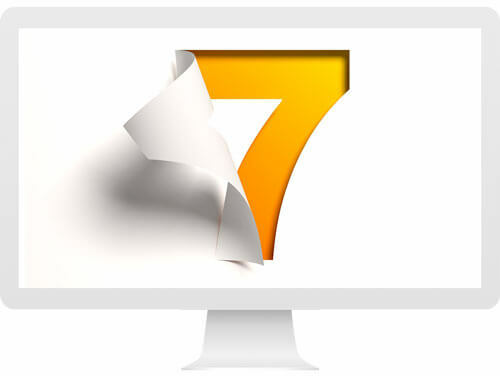 The Epicurean theme supports this need by integrating seamlessly with the powerful and popular Contact Form 7 plugin. Your contact form will be fully styled and will match your brand without any additional steps. Search Engine Optimization (SEO) is a fact of life for all food bloggers. Careful attention to filling out SEO Titles and META Descriptions can make the difference between showing up on the first page for your identified search terms or the fifth page. Epicurean fully integrates with the Yoast SEO plugin which means you'll have all the tools you need in order be found in search. 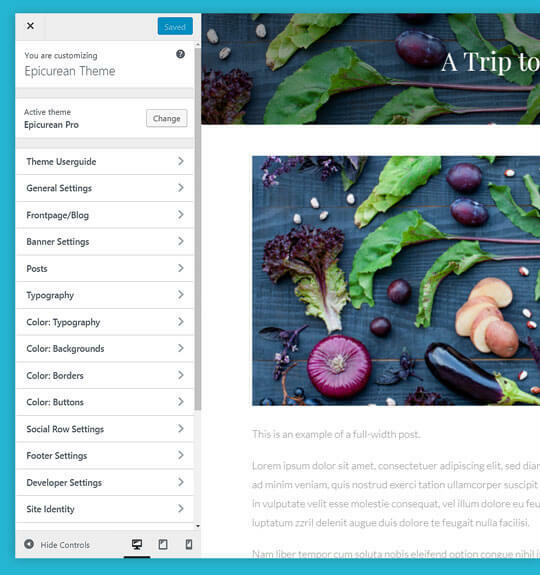 The Epicurean theme provides a wide range of powerful theme options through the WordPress core interface called the Customizer. This means that you will be able to watch a live preview of your website as you choose from hundreds of fonts, layouts, and thousands of color combinations. If you're looking for a theme filled with bloat then you'll want to look elsewhere (themeforest comes to mind). Our themes are lean, mean, fast-loading machines. We make sure you have all the settings you need without bogging you down. Food bloggers more than almost any other professional need to be social media ninjas. It's not at all uncommon for popular food blogs to receive more traffic from social platforms than from search and that's a pretty amazing thing at a time when almost every other sector is totally reliant on their position in the SERPs. Epicurean makes sure your content is fully sharable with built in social sharing icons on every post, and ensures that your visitors are able to reach you through your entire social network with site-wide social identity buttons built-into the theme footer. Great fonts catch the eye and lead the reader deeper into the page. Epicurean supports wide range of font preferences by offering hundreds of Google Fonts to choose from so you will find perfect font to match your brand.